My grandfather Charles Lowry is posing in this photo looking dapper in a double breasted jacket and white tie. I seem to recall other similar photos indicating that this his 8th grade graduation in the spring of 1938 or 1939. 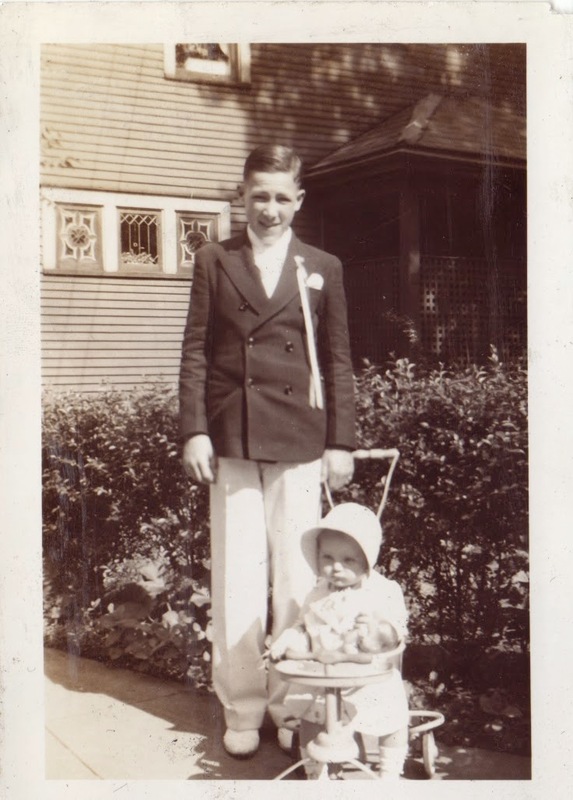 The timing is right, as I think the little girl is is his first cousin Catherine Pepperney who was born in 1937 and would be 1 or 2 years old. Charles James Lowry (1924-2007) and believed to be Catherine Pepperney Campana, photograph, taken at unknown location around 1939; digital image, photocopy of original, scanned in 2013 by Joseph Lowry; privately held by Mary McCaffrey, [address for private use], Canton, Ohio. Young man in dark blazer and white shirt and white pants standing in front of young child on small bike. Provenance is Mary Pepperney Lowry to Charles Lowry to Mary McCaffrey.